This article is about the history, function and symbols of the Swedish monarchy as an institution. For a list of kings and queens regnant of Sweden, see List of Swedish monarchs. For a list of Swedish princes and princesses, past and present, see Swedish Royal Family. The Monarchy of Sweden concerns the monarchical head of state of Sweden, which is a constitutional and hereditary monarchy with a parliamentary system. The Kingdom of Sweden (Swedish: Konungariket Sverige) has been a monarchy since time immemorial. Originally an elective monarchy, it became an hereditary monarchy in the 16th century during the reign of Gustav Vasa, though virtually all monarchs before that belonged to a limited and small amount of families which are considered the royal dynasties of Sweden. Sweden in the present day is a representative democracy in a parliamentary system based on popular sovereignty, as defined in the current Instrument of Government (one of the four Fundamental Laws of the Realm which makes up the written constitution). The monarch and the members of the Royal Family undertake a variety of official, unofficial and other representational duties within Sweden and abroad. Carl XVI Gustaf became King on 15 September 1973 on the death of his grandfather, Gustaf VI Adolf. kunuki, i.e. konungi, the dative case for Old Norse konungr ("king"). A runic inscription of the 11th century (U11) refers to King Håkan the Red. Sweden has been a kingdom since prehistoric times. As early as the 1st century, Tacitus wrote that the Suiones had a king, but the order of succession up until King Eric the Victorious (died 995), is known almost exclusively through accounts in historically controversial Norse sagas (see Mythical kings of Sweden and Semi-legendary kings of Sweden). Originally, the Swedish king had combined powers limited to that of a war chief, a judge and a priest at the Temple at Uppsala (see Germanic king). However, there are thousands of runestones commemorating commoners, but no known chronicle about the Swedish kings prior to the 14th century (though a list of kings was added in the Westrogothic law), and there is a relatively small amount of runestones that are thought mention kings: Gs 11 (Emund the Old), U 11 (Haakon the Red) and U 861 (Blot-Sweyn). About 1000 A.D., the first king known to rule both Svealand and Götaland was Olof Skötkonung, but further history for the next two centuries is obscure, with many kings whose tenures and actual influence/power is unclear. The Royal Court of Sweden, however, does count Olof's father as Sweden's first king. The power of the king was greatly strengthened by the introduction of Christianity during the 11th century, and the following centuries saw a process of consolidation of power in the hands of the king. The king was traditionally elected from a favored dynasty at the Stones of Mora, and the people had the right to elect the king as well as depose him. The ceremonial stones were destroyed around 1515. In the 12th century, the consolidation of Sweden was still effected by dynastic struggles between the Erik and Sverker clans, which ended when a third clan married into the Erik clan and the House of Bjelbo was established on the throne. That dynasty formed a pre-Kalmar Union Sweden into a strong state, and finally king Magnus IV even ruled Norway and Scania. Following the Black Death, the union was weakened, and Scania was reunited with Denmark. In 1397, after the Black Death and domestic power struggles, Queen Margaret I of Denmark united Sweden, Denmark and Norway (then including Finland and Iceland) in the Union of Kalmar with the approval of the Swedish nobility. Continual tension within each country and the union led to open conflict between the Swedes and the Danes in the 15th century. The union's final disintegration in the early 16th century led to prolonged rivalry between Denmark-Norway and Sweden (with Finland) for centuries to come. 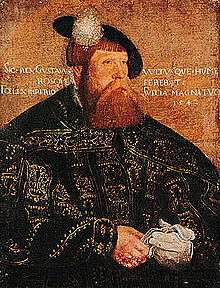 Gustav I, portrayed here in 1542 by Jakob Binck, legally created the hereditary monarchy and organized the Swedish unitary state. Catholic bishops had supported the King of Denmark, Christian II, but he was overthrown in a rebellion led by nobleman Gustav Vasa, whose father had been executed at the Stockholm bloodbath. Gustav Vasa (hereinafter referred to as Gustav I) was elected King of Sweden by the Estates of the Realm, assembled in Strängnäs on 6 June 1523. Tax reforms took place in 1538 and 1558, whereby multiple complex taxes on independent farmers were simplified and standardised throughout the district and tax assessments per farm were adjusted to reflect ability to pay. Crown tax revenues increased, but more importantly the new system was perceived as fairer. A war with Lübeck in 1535 resulted in the expulsion of the Hanseatic traders, who previously had had a monopoly on foreign trade. With its own burghers in charge, Sweden's economic strength grew rapidly, and by 1544 Gustav controlled 60% of the farmlands in all of Sweden. Sweden now built the first modern army in Europe, supported by a sophisticated tax system and an efficient bureaucracy. At the death of King Gustav I in 1560, he was succeeded by his oldest son Eric XIV. His reign was marked by Sweden's entrance into the Livonian War and the Northern Seven Years' War. The combination of Eric's developing mental disorder and his opposition to the aristocracy led to the Sture Murders in 1567 and the imprisonment of his brother John (III), who was married to Catherine Jagiellon, sister of King Sigismund II of Poland. In 1568 Eric was dethroned and succeeded by John III. In domestic politics John III showed clear Catholic sympathies, inspired by his queen, creating friction with the Swedish clergy and nobility. He reintroduced several Catholic traditions previously abolished, and his foreign policy was affected by his family connection to the Polish–Lithuanian Commonwealth, where his eldest son had been made King Sigismund III in 1587. [n 3] Following the death of his father, Sigismund tried to rule Sweden from Poland, leaving Sweden under the control of a regent — his paternal uncle (Gustav I's youngest son) Charles (IX) — but was unable to defend his Swedish throne against the ambitions of his uncle. In 1598 Sigismund and his Swedish-Polish army was defeated at the Battle of Stångebro by the forces of Charles, and he was declared deposed by the Estates in 1599. 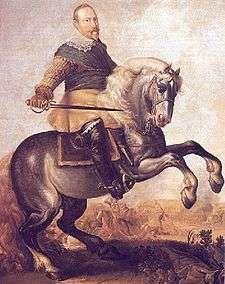 The Lion of the North: King Gustavus Adolphus depicted at the turning point of the Battle of Breitenfeld (1631) against the forces of Johann Tserclaes, Count of Tilly. As the heiress presumptive, at the age of six Christina succeeded her father on the Swedish throne (being the only person left in the line of succession), although a recency government would rule in her name until she turned 18 years of age. During the regency, Chancellor Axel Oxenstierna wrote the 1634 Instrument of Government, which although never approved by any monarch, nevertheless would continue to have an important normative role in the state administration. Christina early on showed an interest in literature and the sciences and famously brought René Descartes to Sweden. Sweden continued to be involved in the Thirty Years' War during reign of Christina and that conflict was settled at the 1648 Peace of Westphalia, and the Swedish monarch received representation at the Imperial Diet due to the German conquests (Bremen-Verden and Swedish Pomerania) that were made. [n 7] After having decided not to get married, Christina abdicated the throne on 5 June 1654, in favor of her cousin Charles Gustav[n 8], went abroad and converted to Roman Catholicism. Charles XI at the Battle of Lund in 1676. Painting by David Klöcker Ehrenstrahl. The Estates elected Charles X Gustav as their new King and his short reign is best characterized by foreign wars: first a lengthy campaign within Poland and then with Denmark. In the latter case, the risky 1658 March across the Belts which resulted in the Treaty of Roskilde, would prove to be the largest permanent territorial gain Sweden ever had: Skåne, Blekinge and Bohuslän now became Swedish provinces and have remained so ever since. Charles X Gustav was not satisfied, as he wanted to crush Denmark once and for all, but the 1659 Assault on Copenhagen did not prove successful for the Swedes, much of it due to the Dutch naval intervention to the aid of the Danes. Charles X Gustav died in Gothenburg in 1660 and as the Crown passed to his five-year-old son Charles XI, a new regency government would assume the responsibilities of the state. The regency government, composed of aristocrats and led by Chancellor Count Magnus Gabriel De la Gardie, was more interested in feathering their own nests rather than to work in the interest of the country at large. When Charles XI came of age in 1672, the effectiveness of the armed forces had seriously deteriorated and the country was ill-prepared as the King of Denmark, Christian V, invaded to settle old scores. The Danes were ultimately unsuccessful in their attempts, and Charles XI would undertake several measures to prevent what had just almost happened from occurring again: reducing the influence of the aristocracy by nationalizing estates and properties which had been handed out to them by his predecessors, introducing the Allotment system (Swedish: indelningsverket) which would form the basis of the armed forces until the 20th century, and with the support of the Estates he was declared in 1680 an absolute monarch. Charles XII's sister, Ulrika Eleonora, had now inherited the throne but she was forced by the Estates to sign the 1719 Instrument of Government, which ended the absolute monarchy and made the Riksdag of the Estates the highest organ of the state and reduced the role of monarch to a figurehead. The Age of Liberty (Swedish: frihetstiden) with its parliamentary rule, dominated by two parties — the Caps and the Hats — had begun. Ulrika Eleonora had had enough after a year on the throne and abdicated in favor of her husband, Frederick, who had little interest in the affairs of state and was elected King by the Estates as King Frederick I, resulting in the 1720 Instrument of Government: content-wise almost identical to the one from 1719. Despite having many extra-marital affairs, Frederick I never sired a legitimate heir to the throne. The 1720 Instrument in Government was later replaced by the 1772 Instrument of Government in a self-coup orchestrated by King Gustav III. 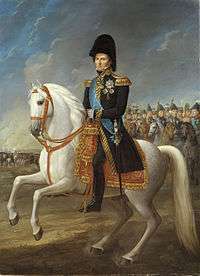 Crown Prince Charles John at the Battle of Leipzig (1813). Painting by Fredric Westin. On 17 September 1809 in the Treaty of Fredrikshamn, as a result of the poorly managed Finnish War, Sweden had to surrender the eastern half of Sweden to Russia. King Gustav IV Adolf and his descendants were deposed in a coup d'état led by dissatisfied army officers. The childless uncle of the former king was almost immediately elected as King Charles XIII. The Instrument of Government of 1809 put an end to royal absolutism by dividing the legislative power between the Riksdag (primary) and the King (secondary), and vested executive power in the King when acting through the Council of State. The present Bernadotte dynasty was established in September 1810 when the Riksdag, convened in Örebro, elected French Marshal and Prince of Pontecorvo Jean-Baptiste Jules Bernadotte as Crown Prince. This took place because Charles XIII had no legitimate heir, and a Crown Prince previously elected in January 1810, Charles August, suddenly had died of a stroke during a military exercise. Although the 19th century Bernadotte monarchs that would follow Charles XIV John's reign tried to defend the power and privileges they still had, the tide incrementally turned against "personal regal rule" (Swedish: personlig kungamakt) with the growth of the liberals, social democrats, and the expansion of the franchise. When King Gustav V publicly objected to the defence budget cuts made by Prime Minister Karl Staaf and the cabinet just before the First World War in event known as the Courtyard Crisis accompanied by the Peasant armament support march (Swedish: bondetåget), it was seen as a deliberate provocation by conservatives and reactionaries against the uncodified norm of a parliamentary system supported by the liberals and the social democrats, leading to Staaf's resignation. Gustaf V then appointed a caretaker government, supported by the conservatives, led by legal scholar Hjalmar Hammarskjöld, which remained in power longer than expected due to the outbreak of World War I (in which Sweden remained neutral) and increased defence spending was no longer a controversial issue. Nevertheless, in the year of the outbreak of the Russian revolution, social tensions continued to rise; the general election in 1917 gave the liberals and social democrats greatly strengthened representation in both Riksdag chambers and a conservative government was no longer a defensible option. Following the definite breakthrough of parliamentarism in 1917, with the appointment of the coalition government of liberals and social democrats led by Professor Nils Edén, the political influence of the King was considerably reduced and an unwritten constitutional precedent was set that would remain in effect until 1975. Only during World War II, in the so-called Midsummer crisis (regarding the issue whether neutral Sweden should permit rail transport of German troops from Norway passing through to Finland), did Gustaf V allegedly try to intervene in the political process by threatening to abdicate. King Gustaf VI Adolf succeeded his elderly father who died in 1950, and he is generally regarded as a constitutional monarch who stayed out of politics and controversy. In 1954, a royal commission began work on whether Sweden should undergo constitutional reform to adapt the 1809 Instrument of Government to current political realities, or whether a new one should be written; ultimately the latter idea was chosen. The future role of the monarchy was settled in a manner well known within Swedish political discourse: a political compromise reached at the summer resort Torekov in 1971 (hence known as the Torekov compromise, Swedish: Torekovskompromissen) by representatives of four of the parties in the Riksdag (the Social Democrats, the Centre Party, the Liberal People's Party, and the Moderate Party, that is all the parties except the Communists). [n 10] It mandated that the monarchy would remain largely as it was but would become entirely ceremonial, without any residual political powers left. Following the required double Riksdag votes that took place in 1973 and 1974, a new Instrument of Government was brought into effect. The monarch's functions and duties, as defined in the 1974 Constitution Act, include heading the special cabinet council held when there is a change of government, but no executive powers with respect to the governance of the realm are vested in him. When, on 1 January 1975, it replaced the Instrument of Government of 1809 as part of the Constitution of Sweden, the Instrument of Government of 1974 (Swedish: 1974 års regeringsform) transformed the advisory Council of State (Swedish: Statsrådet) into the collegial Government (Swedish: Regeringen), to which all executive power was transferred. Responsibility for nominating and dismissing the prime minister (who, since 1975, is elected by the Riksdag) was transferred to the Speaker of the Riksdag and the prime minister appoints and dismisses the other ministers at his or her discretion. [n 11] Further, bills passed by the Riksdag become law without royal assent: the prime minister or any other cabinet minister signs them "On Behalf of the Government" (Swedish: På regeringens vägnar). Although the unwritten precedent was set in 1917, when Gustaf V had little choice but to support the idea of a parliamentary system and promised Prime Minister Nils Edén to stop seeking advice from secret advisors other than the duly appointed cabinet ministers and not to interfere in politics again; the Torekov compromise, struck in 1971 by the four major parties at the time, provided, and continues to provide, a majority consensus in Swedish political discourse on the role of the monarchy within the constitutional framework. The official motive for the radical changes which came to pass in 1975 was for it to be as descriptive as possible of the workings of the state and clear on how decisions actually are made. Minister of Justice Lennart Geijer further remarked on the 1973 government bill that any continued pretensions of royal involvement in government decision making would be of a "fictitious nature" and therefore "highly unsatisfactory". Thus, the monarch lost all formal executive powers, becoming a ceremonial and representative figurehead. The monarch, while explicitly referred to as the "Head of State" (Swedish: Statschefen) in the 1974 Instrument of Government[n 12], is not even the nominal chief executive. [n 13] The Instrument of Government of 1974 does grant the person serving as king or queen regnant absolute immunity from criminal (but not civil) charges for as long as he or she remains in office. [n 14] The monarch therefore cannot be prosecuted or otherwise held to account for his or her actions, both official and private, in judicial proceedings. None of the other members of the Royal Family or the employees the Royal Court enjoy similar immunity. At the request of the Speaker of the Riksdag, the monarch opens the annual session of the Riksdag (Swedish: Riksmötets öppnande) in the chamber of the Riksdag building. [n 15] The king or queen regnant also receives Letters of Credence of foreign ambassadors sent to Sweden and signs those of Swedish ambassadors sent abroad. The monarch also chairs the Cabinet Council (Swedish: skifteskonselj) in a session that establishes the new government following a general election or major cabinet reshuffle and also chairs information councils (Swedish: informationskonselj) approximately four times a year to get information from the assembled Government, apart from that given by ministers in individual audiences or through other means. Formally, it is the explicit responsibility of the prime minister to keep the monarch informed on the affairs of the realm; the failure to do so following the 2004 tsunami disaster in the Indian Ocean (in which many Swedes perished) gave rise to wide criticism of Prime Minister Göran Persson for his handling of the matter. The monarch also chairs the Advisory Council on Foreign Affairs (Swedish: Utrikesnämnden), a body that enables the government of the day to inform not only the head of state, but also the speaker and representatives of the opposition parties in the Riksdag, on foreign affairs issues in a confidential manner. While the monarch is no longer the commander-in-chief (Swedish: högste befälhavare) of the Swedish Armed Forces, as he once was under the 1809 Instrument of Government (and much older custom, as shown in the history section), King Carl XVI Gustaf retains the honorary ranks of a four star admiral in the Swedish Navy and general in the Swedish Army and Air Force. As part of his court, the monarch has a military staff, which is headed by a senior officer (usually a general or admiral, retired from active service) and includes active duty military officers serving as aides-de-camp to the monarch and his or her family. The monarch and members of the Royal Family undertake a variety of official, unofficial and other representative duties within Sweden and abroad. The monarch and his or her family play a central role in state visits to Sweden and conducts state visits to other nations on behalf of Sweden. Other members of the Royal Family may also represent the country abroad at lesser functions. Perhaps the most globally known ceremony in which the Royal Family annually participate is the Nobel Prize award ceremony held at the Stockholm Concert Hall (and the subsequent banquet in the Stockholm City Hall), where the monarch hands out the Nobel Prizes on behalf of the Nobel Foundation for outstanding contributions to mankind in physics, chemistry, literature, physiology or medicine, and the economic sciences. Eriksgata was the name of the traditional journey of newly elected medieval Swedish kings through important provinces to have their election confirmed by local Things. The actual election took place at the Stone of Mora in Uppland and participation was originally restricted to the people of that area; hence, the need of having the election confirmed by the other parts of the realm. The Eriksgata gradually lost its importance when, as of the 14th century, representatives of other parts of Sweden began to participate in the election. After 1544, when hereditary monarchy was instituted, that meant that the Eriksgata had little practical importance. The last king to travel the Eriksgata according to the old tradition was Charles IX, whose reign began in 1604. Later, kings, up until present times, have made visits to all the Swedish provinces and called them an Eriksgata, while those visits bear little resemblance to the medieval tradition. Sometimes the first part of the Latin title was Svionum or Sveonum, all three words meaning "of the Swedes", not "of Sweden". Götes Konung (King of the Goths) dated back at least to Kings Magnus III, Erik the Saint, and Charles VII (and possibly to Inge the Elder, the title being used in a letter to Inge from the Pope). The title Svea Konung (King of the Swedes) dated to an older era. In the 16th century, it was changed to Sveriges Konung or Rex Sveciae (King of Sweden), a short form of the title that came be used sometimes in less formal circumstances. Grand Prince of Finland, Duke of Scania, Estonia, Livonia, Karelia, Bremen, Verden, Stettin, Pomerania, Kashubia and Wendia, Prince of Rügen, Lord of Ingria and Wismar, Count Palatine of the Rhine, Duke of Bavaria, Jülich, Cleves and Berg. During the reign of the House of Holstein-Gottorp from 1751 to 1818, the title Heir to Norway (Arvinge till Norge) was also used, as well as other titles connected to the Dukes of Holstein-Gottorp. When, after the Napoleonic wars, Norway was in personal union with Sweden, the title included King of Norway, in older Swedish spellings: Sweriges, Norriges, Göthes och Wendes Konung. 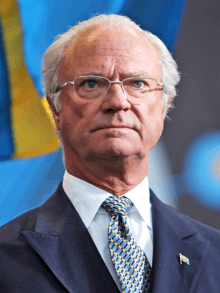 Upon his accession, Carl XVI Gustaf chose for his title simply Sveriges Konung (King of Sweden). This was reflected in his personal motto För Sverige, i tiden ("For Sweden, with the times"). Queen Margrethe II of Denmark did the same in 1972 and, similarly, Harald V of Norway bears no titles except King of Norway. The customary title of the heir apparent is Crown Prince of Sweden (Sveriges Kronprins) or, if female, Crown Princess of Sweden (Sveriges Kronprinsessa). The wife of a crown prince would also receive a corresponding title, but not the husband of a crown princess. 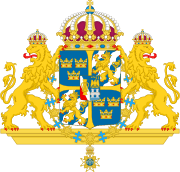 The traditional official title used until 1980 for other dynastic male heirs was Hereditary Prince of Sweden (Sveriges arvfurste), although the word prince (prins) was used in constitutional legal texts such as the Act of Succession and also colloquially and informally. In all cases the title of princesses was Princess of Sweden (Prinsessa av Sverige). Since 1980, the official title of all dynasts is Prince/Princess of Sweden (Prins/Prinsessa av Sverige). King Gustav III revived a tradition from the time of Gustav Vasa and the medieval era by giving male heirs to the throne ducal titles of Swedish provinces. The difference between the ducal titles from the Vasa era and those granted by Gustav III is they now are non-hereditary courtesy titles given at birth. Since 1980, they have been conferred to all royal heirs, male and female. The wives of royal dukes have always shared their husbands' titles; the husbands of royal duchesses have done so as of 2010. The Crown of Eric XIV. Sweden's Royal Regalia are kept deep in the vaults of the Treasury chamber (Swedish: Skattkammaren), located underneath the Royal Palace in Stockholm, in a museum which has been open to the public since 1970. 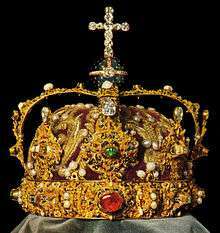 Among the oldest objects in the collection are the sword of Gustav Vasa and the crown, orb, sceptre and key of King Erik XIV. The Regalia is state property and the government authority which holds it in trust is the Legal, Financial and Administrative Services Agency. The last King to have been crowned with a coronation was Oscar II. His son and successor, Gustaf V, abstained from having a coronation. While the crowns and coronets have not been worn by Swedish royalty since 1907, they are nevertheless still displayed on royal occasions such as at weddings, christenings and funerals. 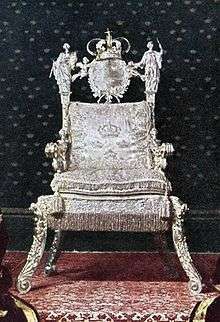 Until 1974, the crown and sceptre were also displayed on cushions beside the Silver Throne at the annual solemn opening of the Riksdag (Swedish: Riksdagens högtidliga öppnande). The Royal orders have a historical basis, dating back to the 1606 founding of the now extinct Jehova Order. The Royal Orders of Knights of Sweden were only truly codified in the 18th century, with their formal foundation in 1748 by King Frederick I. In 1974 the Riksdag significantly changed the conditions and criteria under which orders and decorations could be awarded: that no Swedish citizen outside the Royal Family is eligible to receive such decorations. The Order of the Seraphim (Swedish: Serafimerorden) is only awarded to foreign heads of state and members of the Swedish and foreign royal families, while the Order of the Polar Star (Swedish: Nordstjärneorden) can be bestowed on any non-Swedish citizen. Following the reforms, the Order of the Sword (Swedish: Svärdsorden) and the Order of Vasa (Swedish: Vasaorden) are no longer conferred: officially they have been declared as "dormant". Since 1975, H. M. The King's Medal (Swedish: H.M. Konungens medalj) is the highest honour that can be awarded to Swedish citizens other than members of the Royal Family. The Royal Palaces (including the Royal Palace in Stockholm, Drottningholm Palace, Haga Palace, Rosendal Palace, Ulriksdal Palace, Rosersberg Palace, Tullgarn Palace and Gripsholm Castle) are the property of the Swedish state, managed by the National Property Board (Swedish: Statens fastighetsverk) and are at the disposal of the Monarch, an arrangement that has been in place since the beginning of the 19th century. In addition, there are also residences which are held privately by the Royal Family, such as Solliden Palace on the island of Öland, a cottage in Storlien in the Jämtland and Villa Mirage in Sainte-Maxime in southern France (originally acquired by Prince Bertil). The Royal Palace in Stockholm, as seen from the tower of the Cathedral. The Royal Palace (Kungliga slottet), also known as Stockholm Palace (Swedish: Stockholms slott), is the official residence of the King. The Royal Palace is located on Stadsholmen ("City Island"), commonly known as Gamla Stan ("the Old Town") in the national capital city Stockholm. The offices of the King, other members of the Swedish Royal Family, and the offices of the Royal Court are located in the Palace. The Royal Palace is used for representative purposes and State occasions by the King. The Royal Palace is guarded by Högvakten, a royal guard, consisting of regular service members of the Swedish Armed Forces. The tradition of having a regular unit of the Army guarding at the royal residence dates back to 1523. Until the mid 19th century, the royal guards also maintained law and order in the city and provided firefighting services. The castle Tre Kronor, located on the site of today's palace, in a painting from 1661 by Govert Dircksz Camphuysen. The southern façade faces the grand style slope Slottsbacken; the eastern façade borders Skeppsbron, an quay which passes along the eastern waterfront of the old town; on the northern front Lejonbacken is a system of ramps named for the Medici lions, sculptures on the stone railings; and the western wings border the open space Högvaktsterrassen. The Royal Palace in Stockholm is unique among European royal residences in that large portions of it are open year round to visitors, who pay entrance fees. The first building on this site was a fortress with a core tower built in the 13th century by Birger Jarl to defend the entry into Lake Mälaren. The fortress gradually grew to a castle, known as Tre Kronor: named after the spire on the centre tower with Three Crowns, which have become the Swedish national symbol. [n 14] In the late 16th century, work was done to transform the castle into a Renaissance palace during the reign of John III. In 1690, it was decided that the castle be rebuilt in Baroque style in a design by Nicodemus Tessin the Younger. In 1692, work began on the northern row. However, much of the old castle was destroyed in a disastrous fire on 7 May 1697. Tessin rebuilt the damaged palace, and work continued for another 63 years. Semicirclular wings around the outer western courtyard were finished in 1734, the palace church was finished in the 1740s, and the exterior was finished in 1754. The royal family moved to the palace with the southwest, southeast, and northeast wings finished. The northwest wing was finished in 1760. In the north, Lejonbacken (the "Lion's Slope") was rebuilt from 1824 to 1830. Drottningholm Palace, a UNESCO World Heritage site is the home residence of the King & Queen. Drottningholm Palace (Swedish: Drottningholms slott) is located at Drottningholm on the island of Lovön (in Ekerö Municipality of Stockholm County), and is one of Sweden's Royal Palaces. It was originally built in the late 16th century. It has served as a residence of the Swedish royal family members for most of the 18th and 19th centuries. Apart from being the current private residence of the King and Queen, Drottningholm Palace is a popular tourist attraction. The gardens and park areas surrounding Drottningholm Palace and adjacent to its buildings are one of the main attractions for the tourists that visit the palace each year. The gardens have been established in stages since the palace was first built, resulting in many different styles. The royal domain of Drottningholm is a well-preserved milieu from the 17th and 18th centuries, inspired by French buildings such as the Chateau of Versailles, and is a UNESCO World Heritage Site, principally because of the Drottningholm Palace Theatre and the Chinese Pavilion at Drottningholm. It was added to the World Heritage List in 1991. Haga Palace is the residence of Crown Princess Victoria and her family. Haga Palace (Swedish: Haga slott), formerly known as the Queen's Pavilion (Swedish: Drottningens paviljong), is located in the Haga Park, Solna Municipality in Metropolitan Stockholm. The palace, built between 1802 – 1805, was modelled after balletmaster Louis Gallodier's Italian villa at Drottningholm by architect Carl Christoffer Gjörwell on appointment by King Gustaf IV Adolf for the royal children. It has been the home or summer house of several members of the Swedish royal family – notably it was the birthplace of the present King Carl XVI Gustaf – until 1966 when King Gustaf VI Adolf transferred its disposal to the Prime Minister and it was turned into a guest house for distinguished foreign official visitors (heads of state and heads of government et cetera). In April 2009, it was announced by Prime Minister Fredrik Reinfeldt that the rights of disposal of the palace would be transferred back to the King and thus could be used by Victoria, Crown Princess of Sweden, and her husband, Prince Daniel, Duke of Västergötland. 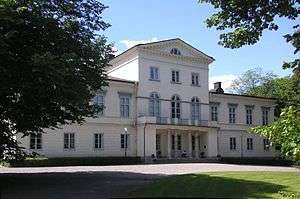 They moved into the palace in the autumn after their wedding on 19 June 2010.
and third, the extended family of the King (Swedish: Kungliga Familjens övriga medlemmar, usually stylized with the shortform Kungl. Famljens övriga medlemmar) which is other close relatives who are not dynasts and thus do not represent the country officially. However, in any case, there is no legislation or other public document which delineates the rules of membership in either the Royal House or Royal Family, as it is left to the sole discretion of the King. The Act of Succession of 1810 provides the rules governing the line of succession and designates the legitimate heirs to the Swedish Throne; it also states in article 4 that the Monarch and dynastic members of the Royal House must at all times be a Protestant Christian of the pure evangelical faith (by implication the Church of Sweden). A rewrite of the Act, entering into force in 1980, fundamentally changed the rules of succession from agnatic primogeniture to absolute primogeniture. This allowed for the crown to pass to the eldest child regardless of gender and thus retroactively installed Princess Victoria as Crown Princess (heir apparent) over her younger brother Prince Carl Philip who had been born as Crown Prince. In its present reading, Article 1 of the Act of Succession limits the potential number of claimants to the throne, so that only the descendants of Carl XVI Gustaf can inherit the Throne. If the royal house were to be extinct, the Riksdag is not obligated to elect a new royal house, as it once was up until the constitutional reforms of the 1970s. The royal barge Vasaorden, last used at the 2010 royal wedding. ↑ A complete Lutheran church ordinance was not presented until the Swedish Church Ordinance 1571, with a statement of faith finalized by the Uppsala Synod in 1593. ↑ No regnal number—just Sigismund—is used when referring to Sigismund III Vasa as King of Sweden. ↑ The war against Denmark was concluded in 1613 with a peace treaty, which did not cost Sweden any territory, but Sweden was nevertheless forced to pay a heavy indemnity to Denmark (Treaty of Knäred) in order to regain control of Älvsborg fortress. ↑ Meanwhile, a Catholic army under Tilly was laying waste to Saxony. Gustavus Adolphus met Tilly's army and crushed it at the First Battle of Breitenfeld in September 1631. He then marched clear across Germany, establishing his winter quarters near the Rhine, making plans for the invasion of the rest of the Holy Roman Empire. In March 1632, Gustavus Adolphus invaded Bavaria, a staunch ally of the Emperor. He forced the withdrawal of his Catholic opponents at the Battle of Rain. In the summer of that year, he sought a political solution that would preserve the existing structure of states in Germany, while guaranteeing the security of its Protestants. But achieving these objectives depended on his continued success on the battlefield. ↑ In Chapter V of Carl von Clausewitz' On War, he lists Gustavus Adolphus as an example of an outstanding military leader, along with: Alexander the Great, Julius Caesar, Alexander Farnese, Charles XII, Frederick the Great and Napoleon Bonaparte. ↑ Although the local conflict with Denmark-Norway, as part of the Thirty Years' War was settled at the Second Treaty of Brömsebro (1645), in which the Danes ceded the Norwegian provinces of Jämtland, Härjedalen and Idre & Särna as well as the Danish Baltic Sea islands of Gotland and Ösel. Sweden was furthermore exempted from the Sound Dues and received the Danish province of Halland for a period of 30 years as a guarantee of these provisions. ↑ Charles Gustav was the son of John Casimir, Count Palatine of Kleeburg (1589-1652) and Princess Catherine of Sweden (1584-1638), daughter of King Charles IX. ↑ Sweden ceded its Baltic provinces and parts of Finland to Russia in the 1721 Treaty of Nystad. ↑ Also known as the Torekov Agreement (Swedish: Torekovsövernskommelsen). The participants were Valter Åman (s), Bertil Fiskesjö (c), Birger Lundström (fp) and Allan Hernelius (m). ↑ The Speaker of the Riksdag, not the Prime Minister, is considered the second highest public office in the order of precedence, below the head of state. Art. 5. The King or Queen who occupies the throne of Sweden in accordance with the Act of Succession shall be the Head of State. ↑ Given their predominance in 20th century Swedish politics, the public positions taken by the leaders of the Social Democrats are noteworthy; particularly given that their party programme does call for the abolishment of the monarchy. Party leaders and prime ministers Hjalmar Branting, Per-Albin Hansson and Tage Erlander all made statements to the effect of being for a republic in principle whenever the issue was raised, but that it was not worth pursuing (presumably fearing an electoral backlash). At the 1972 party congress of the Social Democrats, Prime Minister Olof Palme publicly defended the Torekov compromise, in response some members that yearned for a republic, by famously characterizing that the upcoming reforms would reduce the constitutional role of the monarchy to nothing but a "plume" (Swedish: plym) and thus paving the way to abolish the monarchy with the stroke of a pen (Swedish: penndrag) at some distant point in the future. Palme emphasized though that other reforms were far more important for the Social Democrats than abolishing the monarchy. Successive leaders (and prime ministers) Ingvar Carlsson and Göran Persson have also defended the status quo. 1 2 This could be interpreted as "for life", given the historical precedent: no voluntary abdication has occurred since Ulrika Eleonora, in 1719 and only three hereditary monarchs have been involuntarily deposed (Eric XIV in 1568, Sigisumnd 1599, and Gustav IV Adolf in 1809). Special meeting for the opening of the Riksdag session Art. 6. A special meeting of the Chamber for the formal opening of a Riksdag session takes place no later than the third day of the session. At the request of the Speaker, the Head of State declares the session open. If the Head of State is unable to attend, the Speaker declares the session open. At this meeting, the Prime Minister delivers a statement of Government policy unless there are special grounds why he or she should refrain from doing so. Supplementary provision 3.6.1 The formal opening of the session after an election to the Riksdag takes place at 2 p.m. on the second day of the session. In years in which no election to the Riksdag has been held, the formal opening takes place on the first day of the session at the same time. The Speaker may appoint another time for the meeting. ↑ According to the Gregorian calendar, the king died on 16 November, but the Julian calendar ("old style") was still used in Protestant Sweden at the time and the same date is still used now. 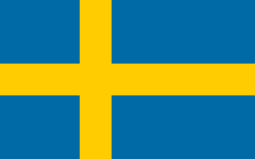 ↑ Flag days are regulated by an ordinance issued by the Government of Sweden. This means that the national flag is flown on all public flag poles and buildings on those dates. 1 2 3 "The Royal Palace of Stockholm". Royal Court of Sweden. Retrieved 2014-02-23. 1 2 3 "Drottningholm Palace". Royal Court of Sweden. Retrieved 2014-02-23. ↑ See the Instrument of Government, Chapter 1, Article 5. ↑ Parliamentary system: see the Instrument of Government, Chapter 1, Article 1. 1 2 "The Monarchy in Sweden". Royal Court of Sweden. Retrieved 2014-02-22. ↑ "The Constitution". The Riksdag. Retrieved 2014-02-22. ↑ Ericson Wolke, Lars; Larsson, Villstrand. Historiska Media, ed. Trettioåriga kriget (in Swedish). pp. 145–148. ISBN 91-85377-37-6. ↑ "Nordisk Familjebok – Axel Gustafsson Oxenstierna". Nordisk Familjebok at runeberg.org (in Swedish). 1914. Retrieved 2014-10-23. ↑ Prinz, Oliver C. (2005). Der Einfluss von Heeresverfassung und Soldatenbild auf die Entwicklung des Militärstrafrechts. Osnabrücker Schriften zur Rechtsgeschichte (in German). 7. Osnabrück: V&R unipress. pp. 40–41. ISBN 3-89971-129-7. Referring to Kroener, Bernhard R. (1993). "Militärgeschichte des Mittelalters und der frühen Neuzeit bis 1648. Vom Lehnskrieger zum Söldner". In Neugebauer, Karl-Volker. Grundzüge der deutschen Militärgeschichte (in German). 1. Freiburg: Rombach. p. 32. ↑ Larsson & Bäck: pp. 66-67. ↑ Larsson & Bäck: pp. 67-68. 1 2 Larsson & Bäck: pp. 68-69. ↑ Larsson & Bäck: pp. 66-69. 1 2 Lewin: pp. 112-115. ↑ Larsson & Bäck: p. 72. 1 2 3 4 5 Torbjörn Bergman (1999). "Trade-offs in Swedish Constitutional design: The Monarchy Under Challenge". In Wolfgang C. Müller and Kaare Strøm, eds., Policy? Office?, or Votes? How Political Parties Make Hard Choices. Cambridge University Press. ISBN 0-521-63723-6. ↑ "Monarken utan formell makt efter Torekovskompromissen". Sveriges Radio (in Swedish). 23 February 2012. Retrieved 22 October 2014. 1 2 3 4 5 "Duties of the Monarch". Royal Court of Sweden. Retrieved 2014-02-22. 1 2 3 "The Head of State". Government of Sweden. Retrieved 2014-02-22. 1 2 Nergelius: pp. 15-16. 1 2 Nergelius: pp. 33-34. ↑ "Forming a government". The Riksdag. Retrieved 2014-10-24. ↑ Larsson & Bäck: pp. 166-170. ↑ Larsson & Bäck: p. 155. 1 2 3 4 Prop. 1973:90. Kungl. Maj:ts proposition med förslag till ny regeringsform och ny riksdagsordning m. m.; given Stockholms slott den 16 mars 1973. p. 172-175. ↑ Larsson & Bäck: pp. 65-69. 1 2 Nergelius: p. 41. ↑ Larsson & Bäck: p. 166. ↑ The Instrument of Government: Chapter 1, Article 5. 1 2 3 "Socialdemokraterna och republikfrågan". Arbetarrörelsen arkiv och bibliotek (Swedish Labour Movement Archives and Library). Retrieved 2014-12-02. 1 2 3 4 5 Nergelius: p. 42. ↑ The Riksdag Act: Chapter 3, Article 6. ↑ "A year in the Riksdag". The Riksdag. Retrieved 2014-10-24. 1 2 Nergelius: pp. 41-42. ↑ "The Advisory Council on Foreign Affairs". The Riksdag. Retrieved 2014-10-24. ↑ "Övriga funktioner" (in Swedish). The Royal Court of Sweden. Retrieved 2014-10-24. ↑ Steve Wilson. "The genius of Sweden's 'Lion of the North'". Military History Online. Retrieved 20 February 2014. ↑ "In Memory of a Great Man". Spokane Daily Chronicle (scanned by Google). 4 November 1901. Retrieved 20 February 2014. ↑ "Swedish Festival Calendar". Swedish Language Training London. Retrieved 20 February 2014. ↑ "Förordning (1982:270) om allmänna flaggdagar". Swedish Code of Statutes. Retrieved 2014-10-21. ↑ See the preamble to the Act of Succession. 1 2 3 "History, The Treasury". Royal Court of Sweden. Retrieved 2014-02-23. 1 2 "Regal symbols". Royal Court of Sweden. Retrieved 2014-02-23. ↑ "The Treasury". Royal Court of Sweden. Retrieved 2014-02-23. ↑ Orders, Swedish Royal Court, date accessed 2014-10-22. ↑ "Svenska folkets slott" (PDF) (in Swedish). Statens fastighetsverk. Retrieved 2014-10-23. ↑ "State administration in Sweden". Government of Sweden. Retrieved 2014-11-13. ↑ "Interests". Royal Court of Sweden. Retrieved 2014-11-13. 1 2 3 "About the Royal Guards". Swedish Armed Forces. Retrieved 2014-02-26. ↑ "Drottningholm Palace Park". Royal Court of Sweden. Retrieved 2014-02-26. ↑ "The World Heritage". Royal Court of Sweden. Retrieved 2014-02-26. ↑ "Buildings in Haga Park". Royal Court of Sweden. Retrieved 2014-02-26. ↑ "Regeringen återlämnar Haga slott" (in Swedish). Government of Sweden. Retrieved 2014-11-13. ↑ "Haga Palace". Royal Court of Sweden. Retrieved 2014-11-13. 1 2 3 "Möt Kungafamiljen" (in Swedish). Royal Court of Sweden. Retrieved 2014-11-23. ↑ "The Act of Succession". The Riksdag. Retrieved 2014-10-24. 1 2 3 Nergelius: pp. 42-44. ↑ See Act of Succession, Article 1. The Instrument of Government (PDF). Stockholm: The Riksdag. 2012. The Act of Succession (PDF). Stockholm: The Riksdag. 2012. The Riksdag Act (PDF). Stockholm: The Riksdag. 2014. Larsson, Torbjörn; Bäck, Henry (2008). Governing and Governance in Sweden. Lund: Studentlitteratur AB. ISBN 978-91-44-03682-3. Levinovitz, Agneta Wallin (2001). Nils Ringertz, ed. The Nobel Prize: The First 100 Years. Imperial College Press and World Scientific Publishing. ISBN 981-02-4664-1. Lewin, Leif (1988). Ideology and Strategy: A Century of Swedish Politics. Cambridge: Cambridge University Press. ISBN 9780521343305. Nergelius, Joakim (2011). Constitutional Law in Sweden. Alphen aan den Rijn: Kluwer Law International BV. ISBN 9789041134356. Petersson, Olof (2010). Den offentliga makten (in Swedish). Stockholm: SNS Förlag. ISBN 978-91-86203-66-5. Roberts, Michael (1992). Gustavus Adolphus. Profiles in Power (2nd ed.). London: Longman. ISBN 0582090008. Truedson Demitz, Jacob (1996). Throne of a Thousand Years. Ludvika & Los Angeles: Ristesson Ent. ISBN 91-630-5030-7. Åse, Cecilia (2009). Monarkins makt. Nationell gemenskap i svensk demokrati (in Swedish). Stockholm: Ordfront. ISBN 978-91-7037-416-6. Wikimedia Commons has media related to Swedish monarchy.